CLAYTON, NC – This past weekend, the Clayton Bootleggers played host to North Carolina State in a double header at East Clayton Community Park. 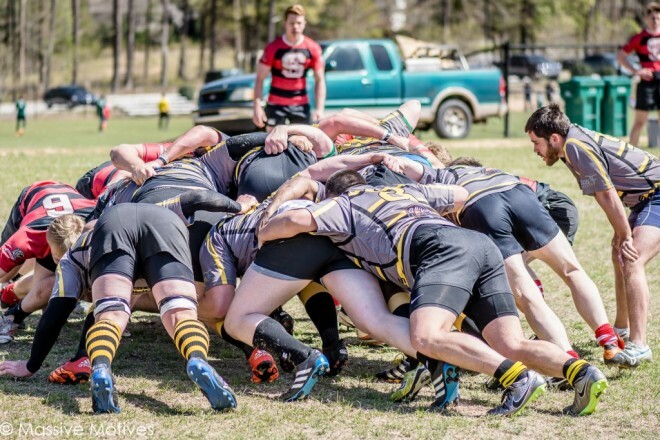 The first match pitted the Clayton 1st XV against the Wolfpack. The match was a fast paced and entertaining affair with the two teams combining for a total of 84 points. It was the pace of the young NC State squad against the power and experience of the Bootleggers. Clayton was first on the board when wing Anthony Crumity cut through the State defense to score. The conversion from flyhalf Brian Beauregard gave the Bootleggers a 7-0 lead. NC State bounced back quickly to tie the match at 7-7. A nice backline movement by Clayton put wing Wesley Smith into space as he scored in the corner for his first career try. Within minutes the Wolfpack closed the gap with a try to leave Clayton ahead 14-12. After the frantic start to the match, the two teams settled in and swapped possession for the next 20 minutes. The Bootleggers began to take the upper hand and capitalized on multiple NC State mistakes. Some strong work at the breakdown led to turnovers that the Clayton backs converted into tries. Beauregard, Manosh Premachandra, and Stuart Mckenzie each added tries as the Bootleggers extended their lead to 29-12 going into halftime. NC State quickly turned the momentum in their favor at the start of the second half as they set out towards cutting into the Bootlegger’s lead. The Wolfpack did exactly that as they added two tries off of Clayton mistakes to cut the lead to 29-24. With NC State closing the gap, Clayton regrouped and stopped the comeback. Beauregard and Premachandra each added their second try of the match and team Captain Simon Potter added a try on a well worked passage of play. The barrage pushed Clayton’s lead to 48-24 with less than ten minutes to play. The Wolfpack added a converted try before Bootlegger No. 8 Gareth Davies crashed over for one last score for the home side. The 53-31 victory was a solid effort for Clayton as they improved their Spring record to 6-3. 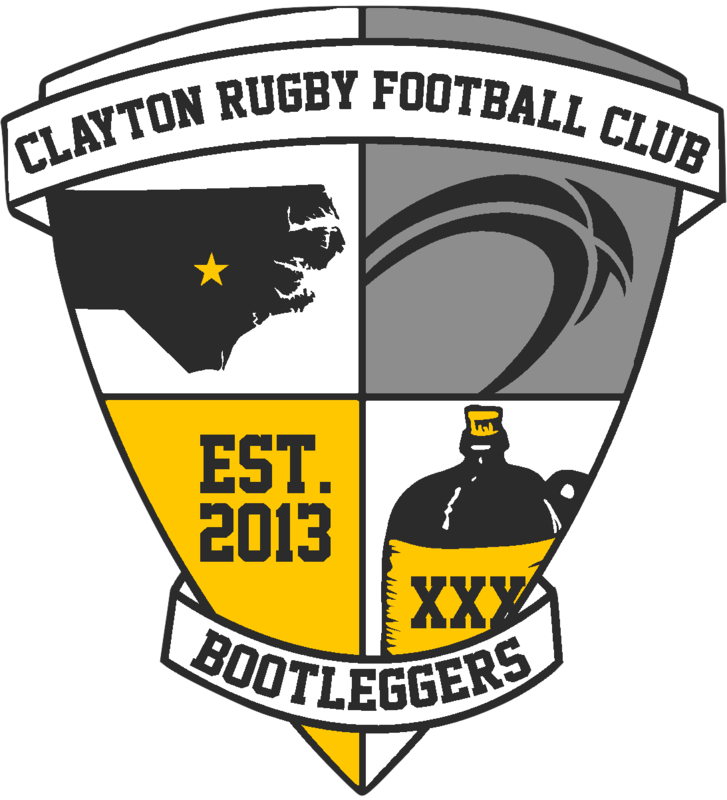 Following the match, the Bootlegger’s 2nd XV took the pitch against NC State. The collegians come out of the gate quickly scoring three tries to take a 17-0 lead, but the Bootleggers tightened up their defense. A try from Anthony Crumity pulled the 2nds to 17-5 going into halftime. The 2nd XV continued their good work on defense in the second half as they held NC State to only one try. Clayton added another try when Eric Hile scored to cut the NC State lead to 24-10. Unfortunately, that was as close as the match would get. The two squads traded possession for the remainder of the match and broke off some long runs, but couldn’t finish. Despite the 24-10 loss, the Clayton 2nds showed improvement from their last outing. It was great experience for players that are pushing to get into the 1st XV.